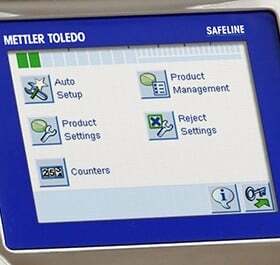 Designed to meet the exacting standards and regulations of the pharmaceutical industry, METTLER TOLEDO Safeline industrial metal detectors provide the ultimate solution in fully integrated product inspection and rejection systems for tablets, capsules, powders and granules. Manufactured from mirror-polished stainless steel, and incorporating pharmaceutical-grade FDA-approved contact parts throughout, Tablex and Pharma GF systems provide compact, easy-clean, hygienic inspection solutions to meet the metal detection needs of pharmaceutical manufacturers. An advanced detection coil design, combined with a choice of proven Safeline software, delivers unrivalled detection performance and on-line stability. This enables even the smallest contaminants to be detected and rejected from the product flow. Systems are designed to detect all possible metal contamination encountered in pharmaceutical manufacturing processes, including ferrous, non-ferrous and even the most difficult-to-detect non-magnetic stainless steels (grade 316). Contaminants less than 0.3mm in diameter can be readily detected and rejected. Al Thika Packaging is the exclusive distributor of Mettler Toledo in the Middle East. Since 1994 Al Thika has been supplying a wide range of machinery including Garvens dynamic Checkweighing systems, Safeline X-ray inspection, Safeline integrated metal detection systems and CI-Vision product inspection systems for food and non-food industries in Dubai, Abu Dhabi, Sharjah, Fujairah, Ras Al Khaimah, Ajman, Umm Al Quwain, Al Ain – UAE, Saudi Arabia, Pakistan, Bahrain, Oman and the many other Gulf countries. Tablex-PRO metal detection systems provide the ultimate in mobile, fully integrated product inspection and rejection systems for tablets and capsules. Tablex 2 metal detectors for tablets and capsules provide the ultimate in mobile, fully integrated product inspection and rejection systems. Capable of detecting and rejecting all metal contaminants in flight, Pharma GF-PRO is a fully integrated product inspection system. Capable of detecting and rejecting all metal contaminants in flight, Pharma GF is a fully integrated product inspection system. Tablex industrial metal detector systems are designed to offer maximum flexibility in process areas. A compact footprint enables systems to be inserted into areas where space is restricted throughout pharmaceutical plants. 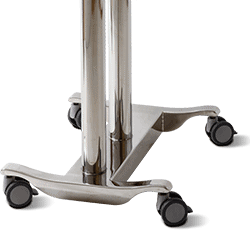 Robust, low-profile, fully rotating castors provide ease of mobility, enabling the system to be utilised in multiple locations. Flexibility is further enhanced by the ability of the detection head to be adjusted easily (without the need for tools) in all three axes to suit any configuration. Meeting the exacting requirements of FDA 21 CFR part 11 can be a challenge in some pharmaceutical processing environments. Tablex-PRO industrial metal detectors support full compliance with the standard by providing dedicated software to capture electronic signatures and other critical process data. This means you remain in total control of processes and the necessary compliance data is always at hand.